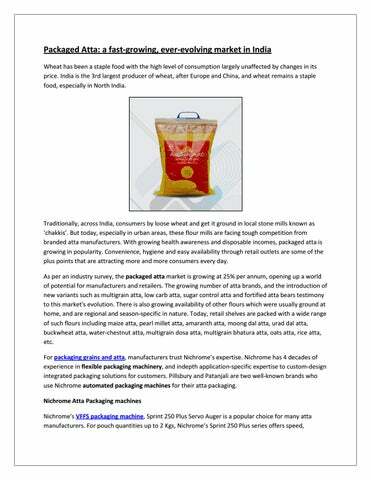 Packaged Atta: a fast-growing, ever-evolving market in India Wheat has been a staple food with the high level of consumption largely unaffected by changes in its price. India is the 3rd largest producer of wheat, after Europe and China, and wheat remains a staple food, especially in North India. accuracy and efficiency for flexible packaging of a wide variety of grains, flours, and other powders such as milk powder, spice powder, coffee powder, nutraceutical powder, etc. Sprint 250 Plus is an automated machine with CE marked PLC and touch screen HMI. Its servo motor driven sealing system can effectively seal with pressure levels maintained. It is programmed to pull the exact length of film required for packaging, and offers a perforation system to deliver a chain of small pouches. Another flour packaging machine is the Excel 400 Plus Servo Auger. The Excel Plus series comes with a plus advantage of automation equipped with CE marked PLC Controller and touch screen HMI. Key features include print mark scanners, static charge eliminator, servo motor driven bag length control system, and adjustable stroke of cross sealing jaws for optimum performance. It is designed as per stringent quality standards, and can be easily integrated to upstream or downstream machines/systems. A range of fillers makes the Excel Plus series a truly versatile packaging solution for atta, powders, granules, grains, snacks, etc. It also offers a variety of pouch formats including 4 line seal, pentaseal, CSPP, gusset pouch and pentaseal with D-cut. The Excel Plus packs quantities up to 10 Kgs at a bagger speed of 80 pouches per minute. 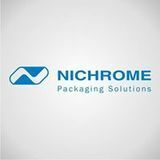 Conclusion Nichromeâ&#x20AC;&#x2122;s expertise in packaging extends beyond primary packaging machines for practically any application. Secondary packaging systems and complete integrated packaging solutions are also a part of the companyâ&#x20AC;&#x2122;s portfolio. Bulk packaging machines, stacking & wrapping, HDPE bad filling systems, horizontal cartoning machine - these are just some of the packaging solutions on offer. Nichrome believes in partnering with customers to understand their needs and challenges before customising the optimal solution. To know how Nichrome can transform performance and cost-efficiency in flour packaging, contact the company today. Nichrome’s expertise in packaging extends beyond primary packaging machines for practically any application.